To open a door without a door knob may seem impossible, but it can be done. There are a few different ways to get the door open using simple tools found in most tool boxes. Door latches have a spring-loaded mechanism that the door knob turns to release it from the door jamb's strike plate. When the knob goes missing, the latch cannot be turned by hand and improvisation is required. A door jamb is the frame into which a door closes. A strike plate is the flat piece of metal that the door knob's latch skims over while the door shuts; it then holds the latch in place to keep the door shut. 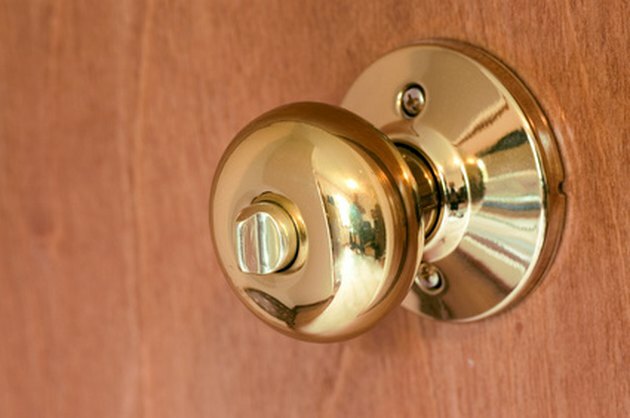 Buy a like brand knob, and use it to open the door. Opening the Door by Removing the Hinge Pins. The hinge pin can be removed. Place a flat-head steel chisel beneath the lip of the upper door hinge pin, and holding the punch at a downward angle, strike it with a hammer until the pin comes loose. 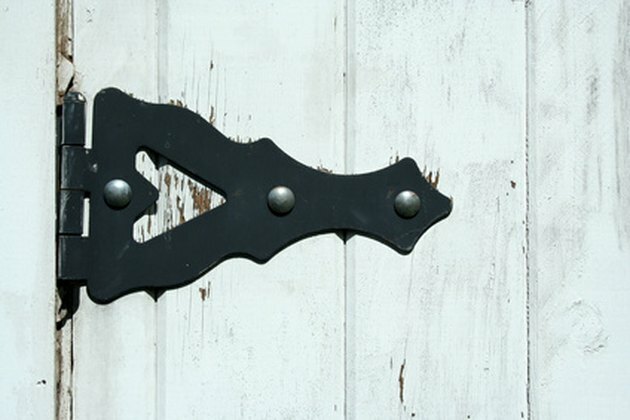 A hinge pin is the steel rod that holds the two halves of the door hinge together; the hinge halves rotate around the hinge pin while the door is opened or closed. Place a round steel punch with a 1/4-inch tip into the bottom of the hinge pin channel and tap the pin upward with a hammer. 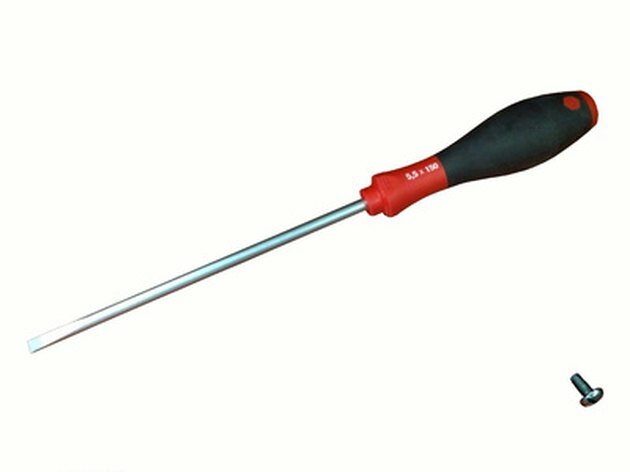 A round steel punch is shaped like a pencil and can be found at most hardware retailers. Repeat steps 1 and 2 to remove all of the pins from the hinges on the door. Pull the door hinge pins out of the hinges and then pull the door out of the door jamb, hinge side first, so that the latch comes out of the strike plate hole. Opening the Door with a Flat-head Screwdriver. Look for the hole through the latch mechanism within the door knob hole. Slide the tip of a flat-head screwdriver into this hole through the latch mechanism and twist toward the hinge side of the door until the latch is retracted from the door jamb's strike plate. Place two fingers into the hole in the door where the door knob is missing and pull or push open the door keeping pressure on the screwdriver until the door opens. Look through the crack between the door and the door jamb to see where the latch mechanism goes into the door jamb's strike plate. 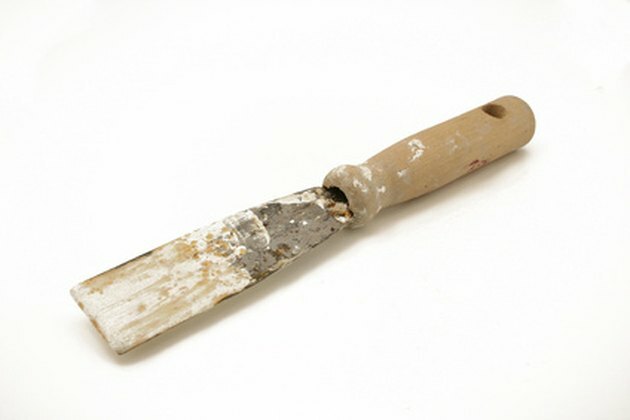 Place a putty knife with a thin, stiff blade on the side of the latch closest to the strike plate. Push in as hard as possible while moving the handle of the putty knife in the direction of the door jamb and the blade of the putty knife in the direction of the door knob hole. Place two or three fingers within the door knob hole and pull outward steadily. As the putty knife pushes, the door latch will slowly retract from the hole in the door jamb. Maintain pulling outward on the door to keep the latch from sliding back into the door jamb's strike plate. Repeat steps 2 and 3 until the latch clears the door jamb's strike plate and then open the door.